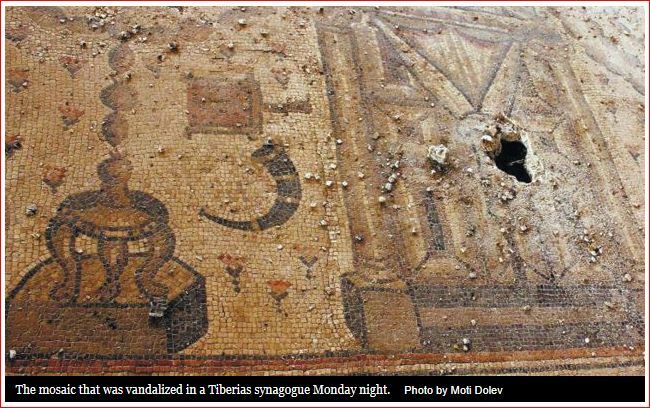 Vandals attacked the ancient synagogue mosaic floor of Hamat Tiberias Monday night, causing severe and perhaps irreparable damage. The synagogue lies within a national park site on the southern outskirts of the modern city of Tiberias, on the western shore of the Sea of Galilee. The floor was iconic and well-known to visitors, depicting a Torah ark as well as implements and ritual objects connected with the Temple and pilgrim festivals. Most striking was a zodiac, usually regarded in ancient art as a Hellenistic and pagan element but embraced by Jews as a decorative motif in the Byzantine period (4th – 7th centuries AD), most likely re-interpreting it in terms of God’s sovereignty over the Cosmos. At Hamat Tiberias yesterday, the evidence, including very pointed spray-painted graffiti, points to the Ultra-Orthodox Jewish community (“Haredi” in modern Hebrew terminology) as the perpetrators of the act. One national park employee said: “Afghanistan is right here” — an obvious reference to a Taliban-like mindset of religious extremism. The ultra-Orthodox have conducted an ongoing, usually low-grade war for many years against the whole practice of archaeology in Israel, based on their presumption that every excavation represents a desecration of ancient Jewish burials. In reality, when bones are found in excavations — which does happen, of course — they are customarily treated with great respect and, usually after some basic analysis, are re-interred. This, in fact, is allowed for by Halakha, traditional Jewish religious law, a point which the Haredim either overlook or perhaps feel is not stringent enough for their liking. One of the graffiti (see below) casts the attack as a reprisal action, in response to digging going on at other sites. One wonders why Hamat Tiberias in particular was targeted. I can’t imagine it was in anyone’s mind but, according to Josephus, when ancient Tiberias was founded by Herod Antipas ca. 15-20 AD the city was in fact built upon a cemetery, and even though the tombs were to be “taken away”, living there was still somehow problematic for religious Jews (Antiquities 18.38). As for the place of the later synagogues and the adjacent hot springs, this seems to have been considered a separate locale with a different name: Emmaus (Ant. 18.36). In any event, it is especially ironic that religious Jews in 2012 would attack this site, since it is very likely the place where the Palestinian Talmud was compiled some 1,600 years ago; at least the synagogue almost certainly represents the place where those revered sages would have worshiped. Also, the attack comes a little late: Hamat Tiberias was excavated back in the 1920s! The fourth-century Hamat Tiberias Synagogue was desecrated Monday night by vandals who sprayed graffiti on the walls and tore up the mosaic floor. The Israel Antiquities Authority suspects extremist ultra-Orthodox Jews who say the authority damages ancient graves during excavations. The vandalism was discovered yesterday morning by employees of the Israel Nature and Parks Authority. Similar acts have been carried out at other archaeological sites; one slogan sprayed Monday night read “A site for every grave [desecrated].” Another read “For Shuka,” probably referring to Shuka Dorfman, the head of the antiquities authority. One employee burst into tears yesterday when viewing the vandals’ work. “Afghanistan is right here,” another added. Tiberias police are investigating the case, while the authority is trying to tally the damages and figure out if anything can be restored. The synagogue, in Hamat Tiberias National Park, was discovered in 1921 by writer and translator Nahum Slouschz. It was uncovered in the first major archaeological dig led by Zionist Jews in the Holy Land. A zodiac wheel drawn on the mosaic appears to have been hit by a pickax. “There are Haredim who believe that if a zodiac wheel is drawn there, it can’t really be a synagogue,” Ben Yosef told Haaretz. “The zodiac wheel, in this case, is actually a judaized Helenistic motif.” One corner of the mosaic was completely taken apart. Ben Yosef added that the synagogue was “probably the site where the Jerusalem Talmud was completed” and that the mosaic contained important symbols such as a holy ark with an ornamental curtain, along with a menorah, a shofar, a ceremonial palm frond and a coal pan. Dina Avshalom-Gorni of the antiquities authority said conservation and restoration work would be carried out, but this wouldn’t be enough. In the past two months several other archaeological sites have been damaged. A mosaic was vandalized at Hurvat Hanut near Jerusalem, a 1,300-year-old furnace was damaged near Yavneh, and a container holding artifacts was set on fire in Afula. This entry was posted in Antiquities, Archaeology, Galilee, Israel-Palestine Scene, Issues in Archaeology, PHOTOS and tagged Hamat Tiberias, Haredim, mosaic, synagogue, Tibrias, ultra-Orthodox. Bookmark the permalink.